Another shot of the broken branch. Rose Vaughan is a Maritimer whose music grabbed many souls when she produced her first album in the 90's My children grew up listening to her music and this song from her first album was on a casette we kept in the car. I know if my daughter sees this post she will swoon. The music is showing up only one time on my edit screen but three times on the post. I don't know why but I did edit this post several times. Rose Vaughan Trio.?.?.. Mary MacADNski: The wind did that as soon as I put the vase down. The top image is an exceptionally brilliant composition Mary! The music is hauntingly beautiful. Mary MacADNski: I had a flower shoot with three vases of flowers. This vase lost the petals of one tulip as soon as I set the vase down. This picture oozes charm Mary, a lovely study in dark and l;ight with some simple colour to punctuate it. Mary MacADNski: All I see is my broken branch. Mary MacADNski: It was not meant to have anything to do with Easter. I had a flower shoot with three vases of flowers a week or so ago. Awesome image, Mary, with the snow. And the "Song of Fog" is haunting! Mary MacADNski: Please check out the website linked on her name. I think you will be pleasantly surprised. Wow Mary, this is a likey to me. Thank you. What a great picture!!!! Mary MacADNski: Thank you so much. It is meaningful to me for the broken branch. This tree is slowly dying but has had such a presence on the property. That's all very odd but the song is showing five times for me. The image itself, though, is lovely; I especially like the composition and the mix of the warm colours and the starkness of the snow. Mary MacADNski: What happened is that every time I edited the post another song appeared. I edited several times and this is the result. There was no indication whatsoever that the link was being repeated when I was in the edit screen. Glad you like the shot. What a fabulous and moving image Mary! A likey for me. Mary MacADNski: I appreciate that, Richard. I love this image for the tree which no one else would appreciate, not living some of it's history. I love the combination of flowers and snow! Mary MacADNski: I do this from time to time. Snow and flowers have a great contrast. Mary MacADNski: Thank you. I edited it and the whiteness appeared. This is one of your best, Mary. Another likey. Mary MacADNski: Thank you very much, Beverly. I love my tulips and I love Rose Vaughan though it was not meant that the music would appear five times. Fabulous shot, Mary. Fine composition. 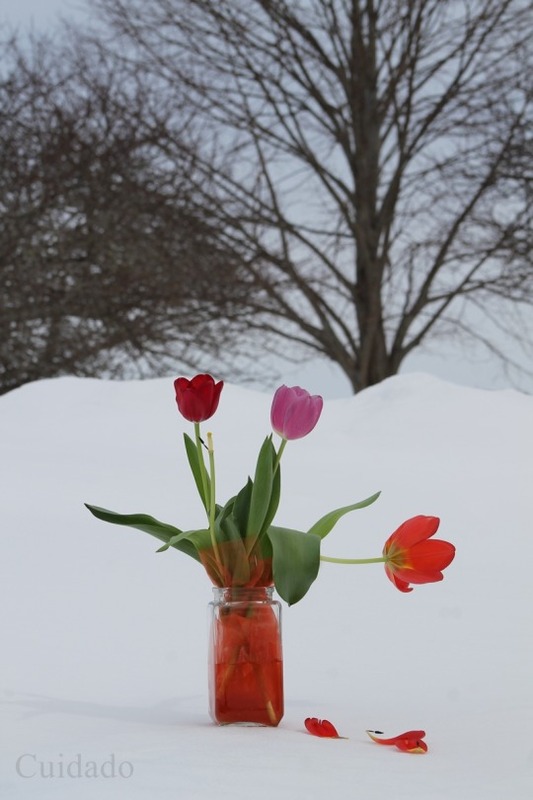 Mary MacADNski: I took dozens of shots of three or four vases in the snow that day. Some winter fun. Mary MacADNski: Every time I edited the post in any way, another song appeared. It only appears as one on the edit page. A lovely touch with the strewn petals. Fine composition. Mary MacADNski: No strewing at all. These orangish tulips are not at all long lasting and the petals of this fell as soon as I sat the vase in the snow. I did not get one shot of all the flowers. The top image is the best of the two for me, by accident, or otherwise, the composition with those loose petals is beautiful. Mary MacADNski: IOt worked out very well but was not intended at all. Mary MacADNski: You are too kind, Larry. Thank you. This first picture is beautiful. You should try to enter it into a contest. Mary MacADNski: I have bad luck with contests. Thank you though.